Monopoly (standard one) for £4.79 at Sainsburys Strathaven. There is quite alot of other toys with 70% off too like hot wheels and flubber kits. Worth a look if your in your local. LOL, you muppet, GO TO JAIL, GO DIRECTLY TO JAIL. Can anyone confirm if this is nationwide? Been on the hunt a few times, only to find its local. hopefully it will be nantionwide if so will be picking one up asap. heat added good buy and find too. I initially thought this was a Sainsburys version of monopoly and felt they really had ran out of variations. Reassuring to know that I misinterpreted. Pretty good if you dont have it. Far far better than this "electronic banker" crap, who the hell would want to play monopoly like that? I initially thought this was a Sainsburys version of monopoly and felt … I initially thought this was a Sainsburys version of monopoly and felt they really had ran out of variations.Reassuring to know that I misinterpreted. Same here! You buy aisles and build fridges and then freezers on them. great game, but monopoly city is the bomb! Still no confirmation if nationwide? Tool late. I have already bought it, and you owe me £18 rent. But it was on my way to jail?! a great price for an original set like this. Great price for a classic game. Bargain considering the price of these "Limited Edition" (which aren't) Monopoly's. If I turn on the water works can I be the dog? And 4.79 for endless nights of family argument and long lasting sourness. What a bargain. People should read the instructions for this game. If you didn't know already, and from experience most people don't, if you don't buy something you land on it immediately goes up for auction. Highest bidder gets it, and you can bid on it yourself too. 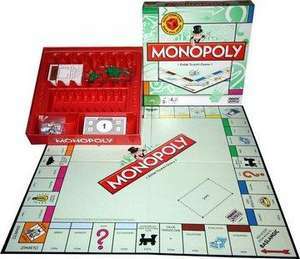 It's IMPOSSIBLE to land on a square in Monopoly and not have that square be bought either by the person landing on it, or by anyone else via auction. This makes the game much tighter, quicker and the auctions make it more exciting. Don't believe me? Simply read the rulebook. That aside, if you're at all into board games, even casually, there are hundreds of much better games than Monopoly and they're nowhere near as complex as most think. Check out Ticket To Ride, Carcassonne and Settlers of Catan. All of them as simple as Monopoly, but far greater design and much more fun. Have sainsburys got the Monopoly on this Deal..
What Monopoly projects is one of the great lies of our economic system: meritocracy. We all start on an equal footing, and if you work hard enough, you’ll come out on top. If you don’t work hard enough, you’ll end up on the bottom and ruined. Essentially, it is a theory of “Economic Darwinism.” (Which in reality is quite funny, as Monopoly is more or less a game of luck with almost no skill, besides haggling for good trades and knowing when to invest and when to save). I prefer the new style, but I too agree there needs to be a little more padding between comments. We still haven't got proof of this being nationwide, true? Nope. This is my biggest issue with HDUK, something gets thousands of degrees of heat over unsubstantiated, unproven or very rare and localized things. Companies are exploiting the hell out of this and similar sites, because they offer some insane deal, it gains tons of customers, and it turns out only one random small branch got a very limited number of product, but the internet goes crazy at a £50 smart phone, or a £20 hard drive, or Mars bars and Snickers 10 packs 24p. And here I was thinking it was a Sainsbury's edition of Monopoly. Disappointed. You've landed on my Basics yogurt so you owe me 47p and 25 Nectar Points.